With four league games remaining, Welling knew that every point counted as the title race entered the latter stages with five sides still in the hunt for promotion. Results elsewhere with Welling having weekends off, meant that their position at the top of the table had been conceded, for the moment at least, with Bridon Ropes now leading on goal difference, and Erith and Belvedere just a point behind. Kennington and Sutton Athletic were also within striking distance. So Welling entered the field with work to do. On ten minutes, Sam Bailey had a shot from 30 yards and was unlucky to see it smash the crossbar and go over for a goal kick. 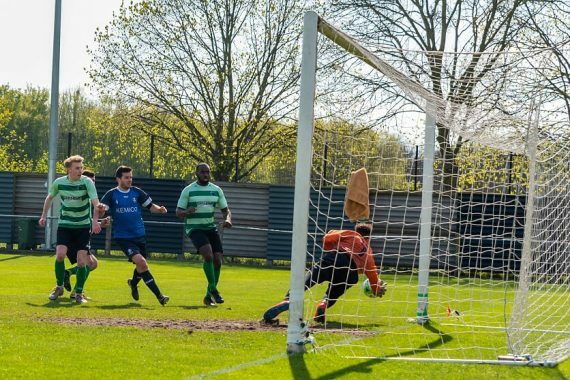 Moments later, a cross from Bailey again was clipped over the bar from top scorer Ryan Golding and with everyone claiming a corner, and the assistant referee awarding one, another goal kick was given by the referee and Forest Hill Park were able to clear their lines. Welling didn’t have to wait much longer for the opener. A good move down the left hand side brought in a cross, and Golding hungry as ever threw himself headlong at the cross to nod home the opening goal to put Welling 1-0 up. Not to be held back, Forest Hill Park were soon in with their own chance. Some good defending, harshly punished by a deflection, put one of their pacey strikers in on goal and a last ditch tackle from Jason Mensah, despite appeals from Forest Hill, were waved away and a goal kick was given. The end-to-end play continued with Harvey Brand next to try his luck, and a strong shot from the right hand side was fumbled by Nathan Edwards in the FHP goal, and fortunately for them the rebound dropped in to no mans land and was cleared. A header just after from Brand was then well saved by Edwards. Beckford, a big and quick threat, was then in for Forest Hill but his effort on goal was straight at home goalkeeper Jack Moore. The first flair point of the match came on 36 minutes. With a foul by a Welling player not given, Forest Hill felt somewhat aggrieved, and their skipper Callum O’Shea, lunged in and was lucky to avoid a caution. On 38 minutes, a great effort on goal from new Dad Mehmet Piro was brilliantly saved by Edwards, and the loose ball from 5 yards helped home from Mensah was blocked without him even knowing it by the outstretched Edwards to keep the score at 1-0. 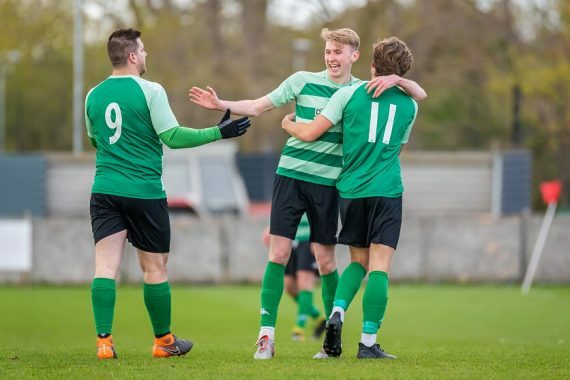 Forest Hill Park were in no mood to give up on the game, and were out of the blocks sharply in the second half, but fortunately an early opportunity fell for Harry Gamble. With time to think in the middle of the box, rather than panic and lash home, Gamble took his time, and poked an effort with the outside of the boot in to the far corner deceiving the rushed efforts of the opponents defenders. 2-0. Shortly after, Golding, holding off his marker on the right, spun in behind and his effort on goal was deflected on to the post and out for a corner. Continued end to end play kept matters entertaining until the 73rd minute when a Mehmet Piro chance from distance was smashed inches over when the game could easily have been killed off. And so the latter stages fizzled out with nothing but half chances towards the end. A well drilled and hard-working Forest Hill Park a good side in this division, and worthy top half achievers, and the promotion and title push for Welling Town continues for another weekend, with just three games to go, two over the Easter weekend, and then the long away trop to Lydd on 27th April. Subs not used – Hepburn, Cody, Brown. 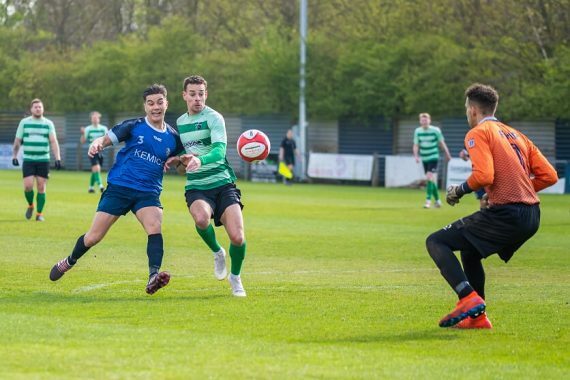 This entry was posted	on Saturday, April 13th, 2019 at 4:47 pm	and is filed under Football, Non-League Football. You can follow any responses to this entry through the RSS 2.0 feed. Both comments and pings are currently closed.